In Mega Manila, the finale of Pinoy Big Brother All In emerged as the No. 1 most-watched primetime program. Daniel Matsunaga (left) was named the Big Winner that night. PBB's counterpart program on GMA-7, Sa Puso ni Dok, landed on the No. 7 slot that night. 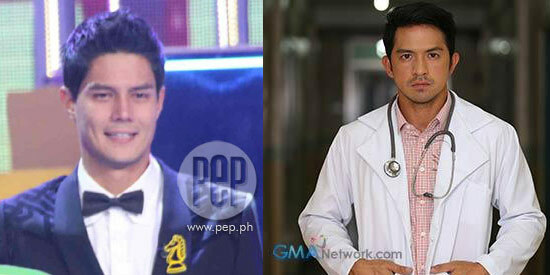 This medical drama stars Dennis Trillo (right). The finale of Pinoy Big Brother All In was the most-watched show on a Sunday night. This is according to the latest ratings data from AGB Nielsen Philippines from Mega Manila households for August 22 to 24, 2014. Pinoy Big Brother All In: The Big Night scored 26.5% on August 24, beating the 15% rating of GMA-7's medical drama Sa Puso ni Dok, which premiered on the same day. Dennis Trillo and Bela Padilla are the lead stars of Sa Puso ni Dok. Pinoy Big Brother All In aired its pilot episode on April 27 as a replacement for The Biggest Loser: Pinoy Doubles. PBB All In aired daily, and has a total of 120 episodes. The reality show performed well in its first few weeks, but its momentum eventually tapered off. In fact, GMA-7 shows like The Master's Sun and Secret Love outperformed PBB All In for weeks before its finale.